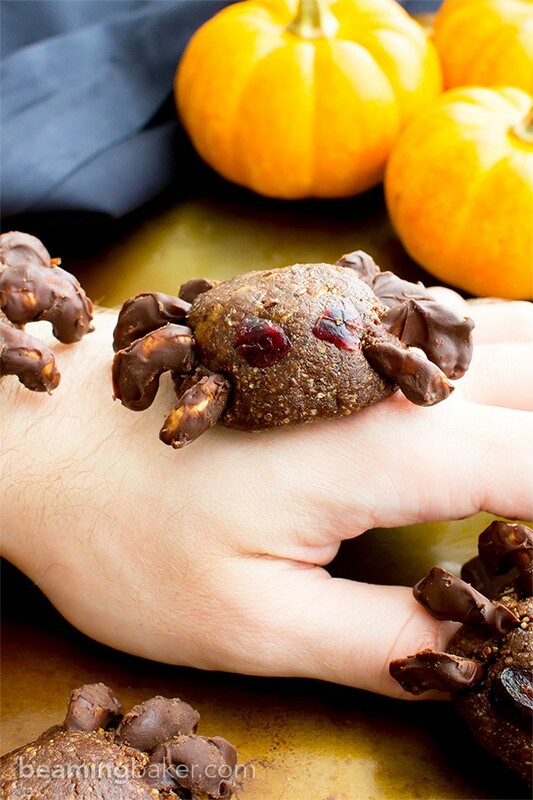 Vegan Halloween Spider Treats (V, GF, Paleo): an 8 ingredient recipe for super fun no bake spider treats packed with fruits and nuts for Halloween! 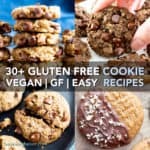 Vegan, Paleo, Gluten Free, Dairy Free. But anyway, my sister Monica knew how absolutely crazy I was about All Hallows’ Eve. So, being the amazing sister that she is, she got us two tickets to Universal Studios, specifically with the intent of us going to their haunted house. Fun, right? At least, that’s the impression I was under until it happened. It was a typically sunny day in Southern California. Monica was happy to take a break from her grad school studies; I was ready to relax after all of my partying studying from being all college-like. We left her apartment early to get a head start at the amusement park. We arrived just around 10 in the morning, bellies full of coffee, donuts and candy (because: Halloween). Driving up to Universal Studios felt like driving into Hollywood. There was everything you’d expect to see: rows of tall palm trees, shiny cars and spectacular tans and sunglasses, everywhere. The day was warm and looking up. We entered the park and dutifully gawked at the celeb/movie cool stuff. Monica pointed out a few movie posters, naming the ones she wanted to see, and asked me what I wanted for lunch. I told her anything but ramen and jumbo slurpees would be great. There was a calm, low-key vibe to everything. Then, we approached the haunted house. Outside, people were lined up, laughing and milling about, gossiping about friends and frenemies, making plans for the hottest Halloween parties that year. We lined up behind a couple: one giant, muscular feat of a man (like, two times Thor) and his small, bubbly galpal. “Dude, I watched The Exorcist like 100 times and I laughed the whole time. I mean, is Psycho supposed to be scary? Cause I thought it kinda sucked,” said Teen Boy #1. As focused as I was on the thought of breadsticks, I couldn’t help but eavesdrop on the two teenage boys behind us. Eavesdropping is standard operating procedure in a waiting line, right? Finally, we were in. Any more eyerolls from me and my eyes would fall out of my head. 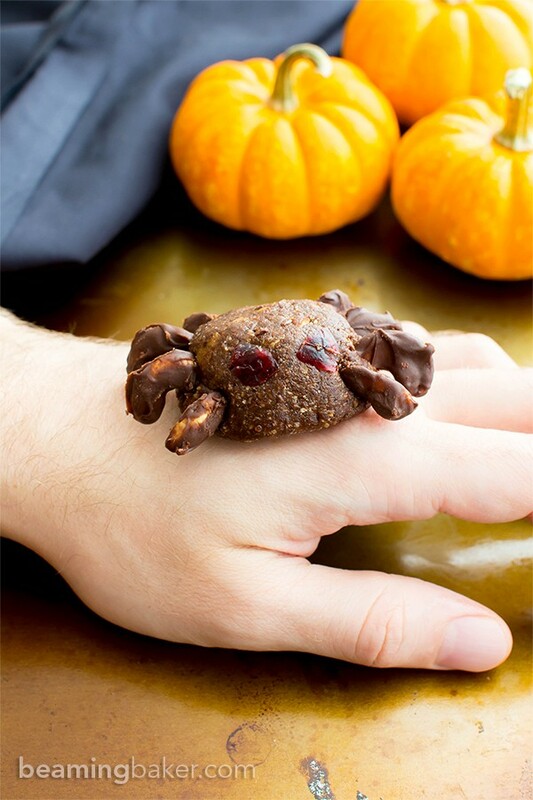 Perfect for Halloween, but not for me. Ahem. Suddenly, everything was dark and cold. The sound of laughter, chatter and babies crying all stopped. I blinked a few times to let my eyes adjust. Monica and I looked at each other and shrugged. Neither of us had ever been in a bonafide haunted house before, as you might have guessed from my sheltered childhood. Double Thor and Galpal walked in front of us, and the TBs followed behind. Somehow, a group of twenty-something girls appeared right next to us. All was quiet, except for a few low whispers. The darkness turned to a soft, eerie blue glow as we walked down one path, as a group. Someone screamed in the distance. A gentle swishing noise repeated over and over again. The sound of crinkling plastic started to fill the air. As we filed down the path, I heard several people make sounds of disgust. I could just barely make out—what the jellybeans was that? Big plastic bags swung from the ceiling. But something appeared to be in them. All tightly packed together so none of us could keep going, not unless we pushed through them. It was time for Monica and I to go through. It was unsettling, but doable, sort of, I thought. Be an adult, you can do this. I tentatively reached out to grab a strip of plastic, being careful not to touch any body parts. My hand quivered as Monica, and the people behind us, looked on. I grabbed another strip with my other hand, readied myself to push two hanging bodies apart, held my breath and pulled. Just as the plastic started to part, everything happened in a blur. A ghostly white hand reached out through the plastic and made its way for me. I looked down, screamed and fell back. With a thump and a few grunts, three or four people behind me all fell, like a row of dominoes. Monica put steel in her spine and proceeded forward, as big sisters do. She parted the plastic and moved through, holding an opening for me, with no incident. Our entire group was a little spooked, and a little jumpy, but still intact. Together, we all walked down a hall filled with a yellow, flickering glow. I could hear an audible sigh as everyone realized this hall was for us to slow down our heart beats and relax a bit. It was just a hallway lit with torches. Nothing more. “I need to kill it!!! It’s EVIL!!! !” I kept whipping at the general demon-arm area, even though the arm was now gone, until Callie put her hand on my shoulder. I glanced over at Double Thor and saw that his hand was holding Galpal’s arm very, very tightly. I blew out a breath, but didn’t release my iron grip on the visitor brochure. I darted her a look of thanks and hugged my sister. Calm down, I told myself. This is Halloween fun, right? Or, this is Halloween madness, I couldn’t decide which. Looking back down the hall, I saw that nothing was amiss. It was as if the torches were never moved, never had demon arms protruding from them. I looked around and saw frightened faces, stony-determination faces, and plain old hysterical ones. We all nodded at each other and started moving again. What happened next was something from our greatest nightmares. But I’ll tell you all about that in the next post. ???????? READ PART TWO HERE ???????? 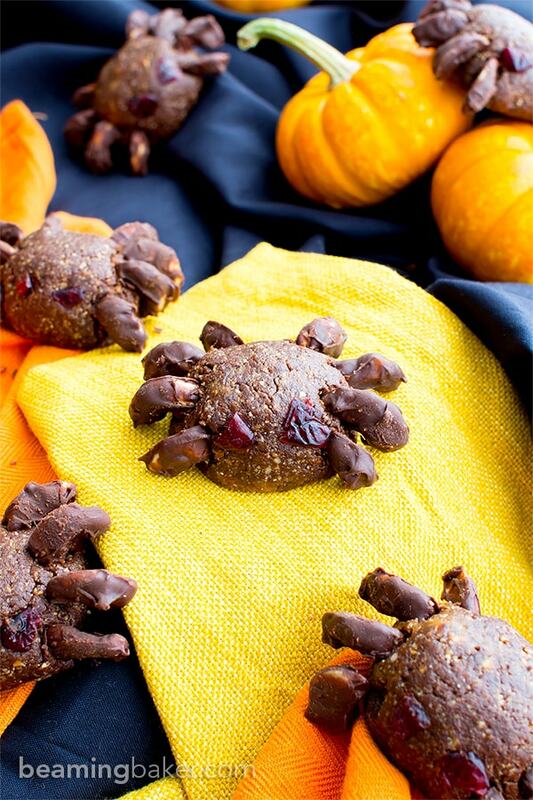 In the mean time, allow me to introduce you to some of the creepiest, but totally fun and festive All Hallows’ Eve goodies: Vegan Halloween Spider Treats! If your heart isn’t already pounding from the above story, maybe these little guys will do it for ya. To be perfectly honest, the photoshoot for these spiders kinda spooked me and Erik out. We could have sworn they were actually moving. Creepy? YES. Fun: Oh, heck yeah! The best part: they’re made with whole ingredients, straight-forward to make and so ridiculously delicious. great for your next Halloween party! 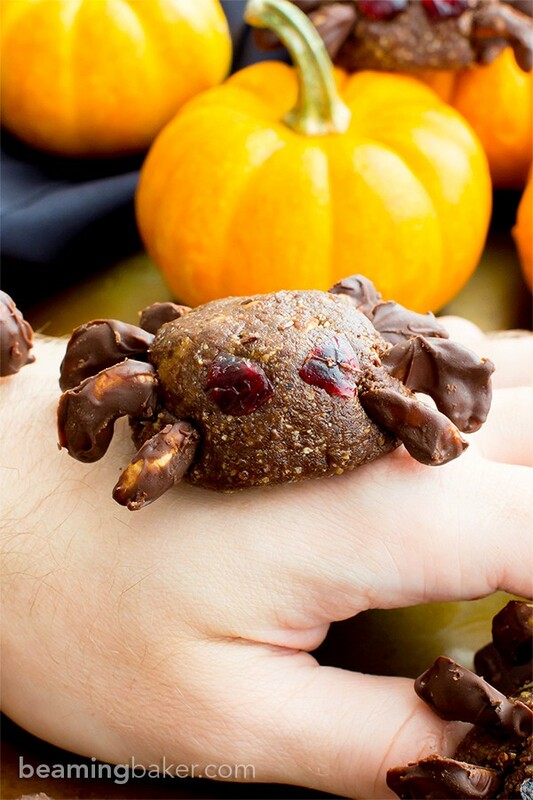 So try your spider leg hand at making something just as scary as Halloween! Tell me, what are some of your favorite memories of Halloween? 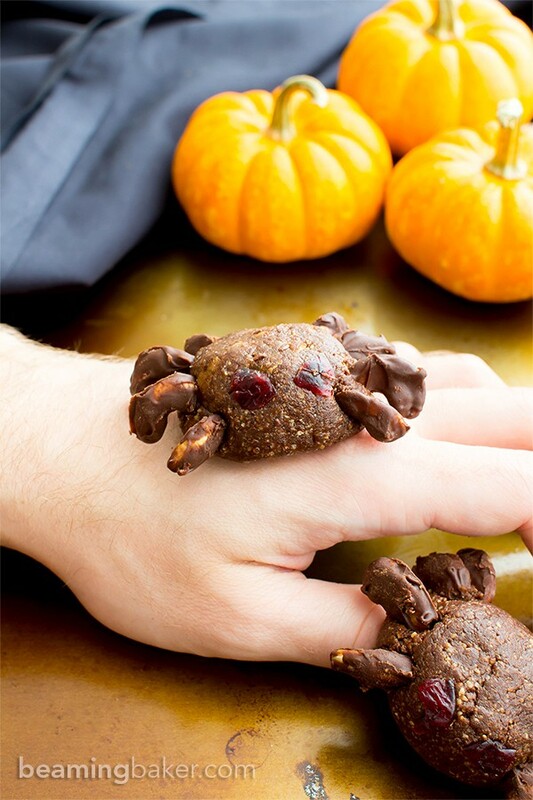 What treats do you always make for your friends and family? I can’t wait to share this wonderful holiday with you! Sending you all my love and maybe even a dove (or a raven, because: HALLOWEEN). xo, Demeter ❤️ ???? Line a medium baking sheet with wax paper or parchment. Set aside for later. 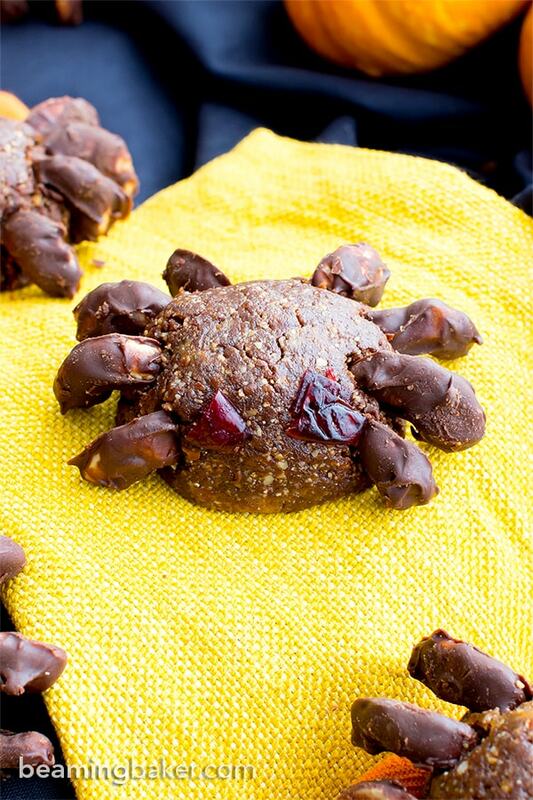 Make the spider bodies: Add dates and almond butter to a food processor. Blend until you get a sticky, crumbly mixture, about 1 minute. Scrape down the sides of the processor as needed. Add in almonds, cocoa powder and salt. 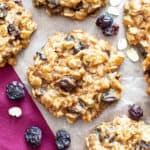 Blend until this mixture becomes dough-like and cohesive, and just slightly crumbly. Pour this mixture into a medium bowl. Press down on the mixture until it resembles dough. 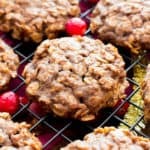 Using your hands, roll about 2 tablespoons into a ball and drop onto the prepared baking sheet. Flatten slightly to resemble a spider’s body. Place “bodies” evenly apart, ensuring enough space to add 4 legs on each side. Repeat until no mixture remains. Cover with plastic wrap and set aside for later. 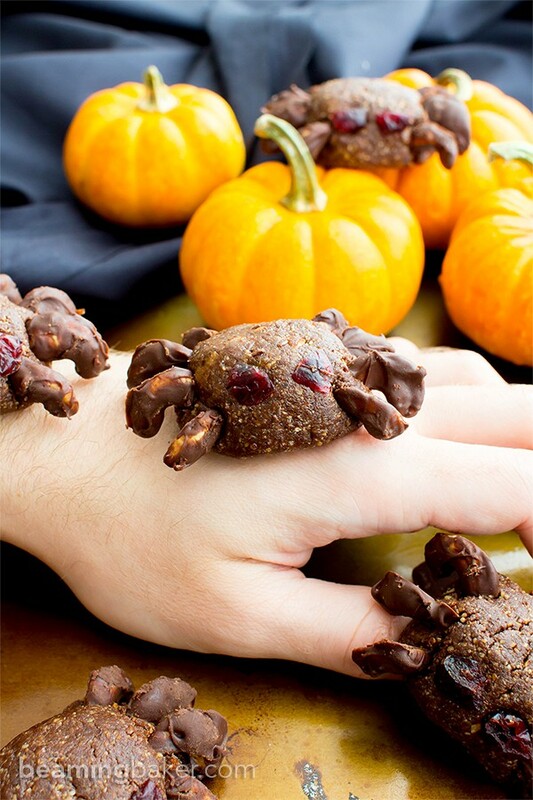 Make the spider legs: Line a small baking sheet with wax paper or parchment. 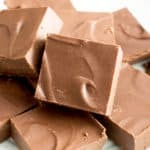 Add chocolate and oil to a small, microwave-safe bowl. Heat in 20-second increments until softened and melted. Stir until smooth. Dip each cashew half completely in chocolate, creating a thin layer of coating. Tap off excess and lay flat on the prepared baking sheet. Repeat until all cashew halves are coated, ensuring that no “legs” touch. 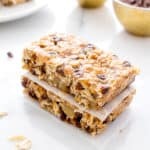 Place in the freezer for 5-10 minutes, or until just hardened. Assemble the spiders: Uncover the spider bodies and remove spider legs from the freezer. Press 4 spider legs into one side of a spider body. Press 4 more legs on the other side. If a body gets crumbly, press back together. Repeat until all spiders have been completed. Press two cranberry “eyes” into the front of each body. - Storage notes: Store in an airtight container in the refrigerator or at room temperature for up to 1 week, or a month in the freezer. Allow to thaw at room temperature for an hour before serving. 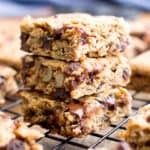 - Fall recipes (v, gf, df): Caramel Apple Tartlets, One Bowl Pumpkin Bread. 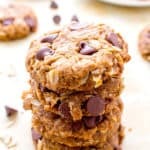 - More cozy recipes: One Bowl Double Chocolate Banana Muffins, Gluten Free Vegan Trail Mix Cookies, Peanut Butter Chocolate Chip Oatmeal Breakfast Bars. 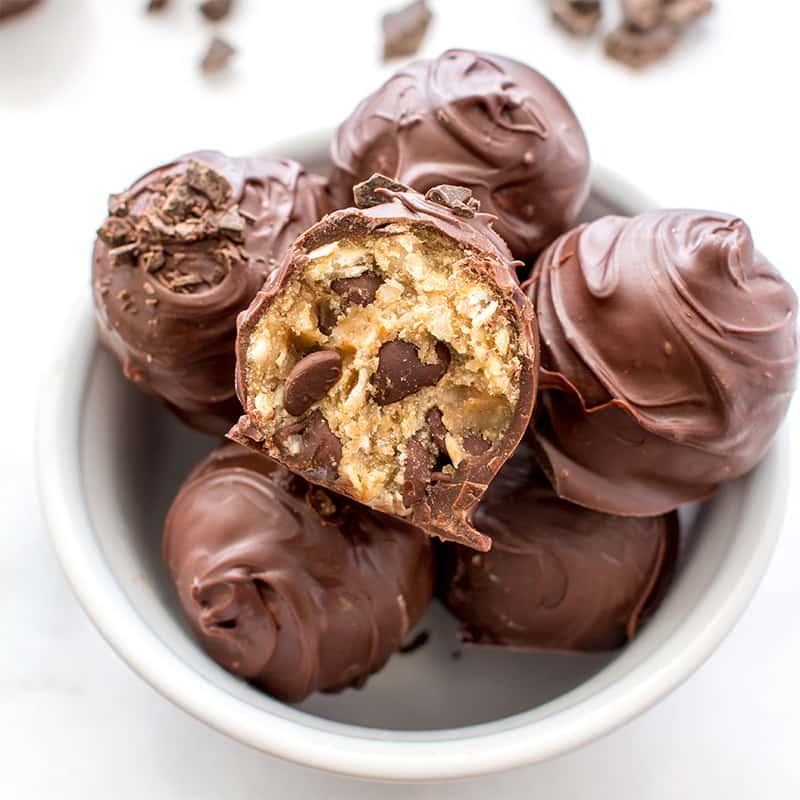 Halloween Treat Idea #1: Chocolate Chip Cookie Dough Truffles (Vegan, Gluten Free, Dairy Free). A reader-favorite, perfect for Halloween! 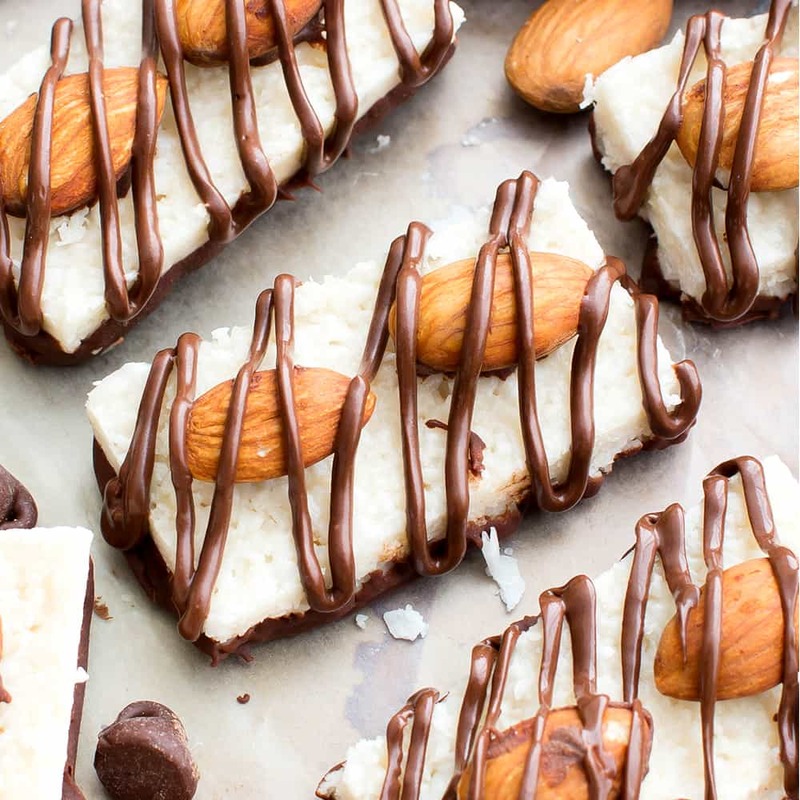 Halloween Candy Idea #1: Paleo Almond Joy (Vegan, Gluten Free, Dairy Free). Frightfully good. Halloween Treat Idea #2: Gluten Free Vegan Peanut Butter Cup Brownies (V, GF, Dairy Free). 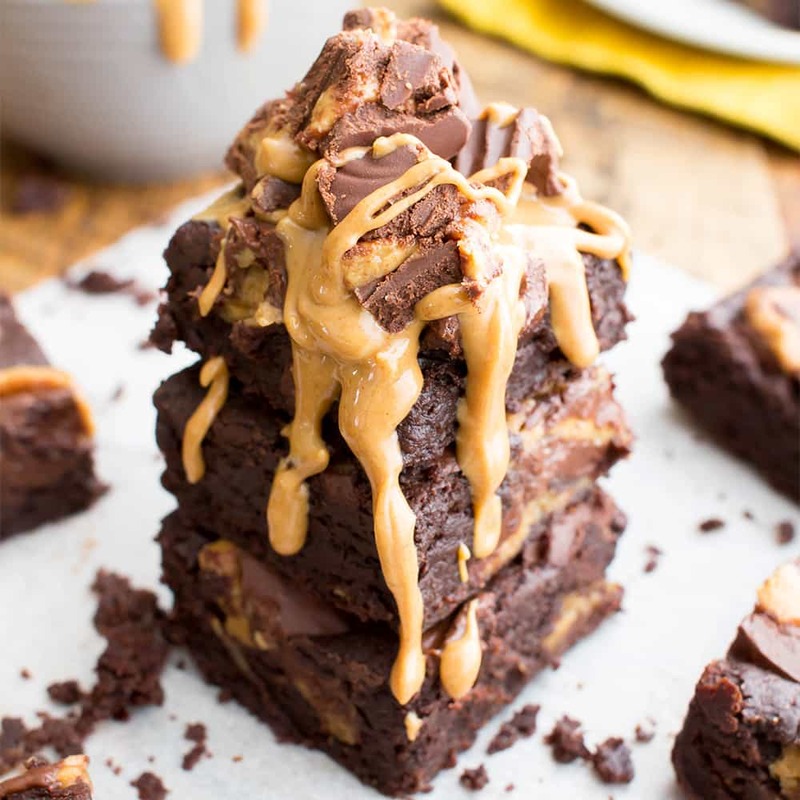 PB Cups love a spooktacular brownie-upgrade! Happy (almost) Halloween! ???? ???? 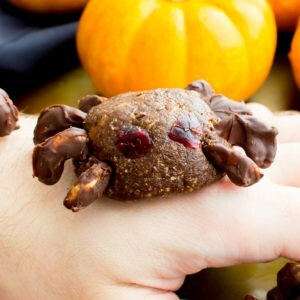 I know you love Halloween, so I’m excited for all of your creative recipes! I love Halloween too, and haunted houses, but I’m such a chicken going through them! I get scared VERY easily (like when someone just walks in a room) so I practically scream through the entire thing. 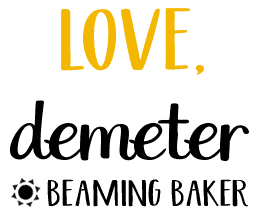 I LOVE this first recipe, Demeter! 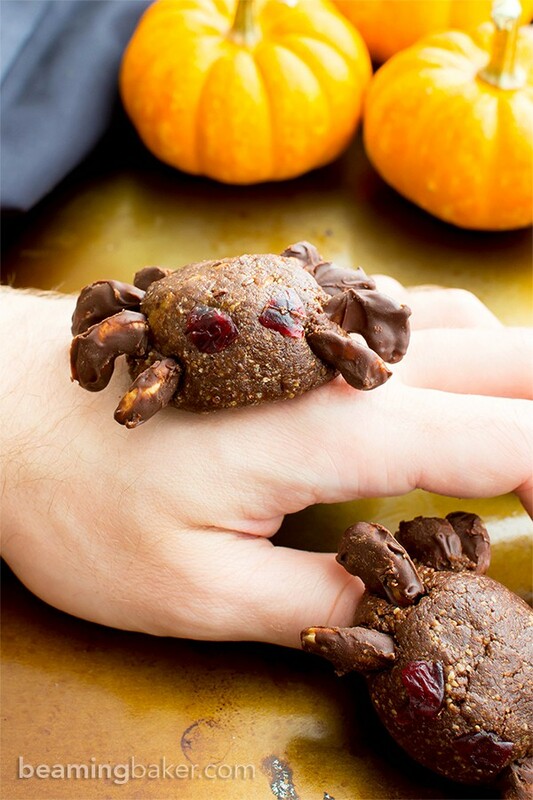 Such an adorable treat! And I would be with you and think that maybe these spiders were moving! 🙂 I would love to munch on a few of these this season. Pinned, of course! Hope your week is off to a great start! Can’t wait to hear more about what happened in that Haunted House, sounded like a lot of fun and scares! I love Halloween for all the same reasons, definitely my favourite holiday. I wish I lived in an area that celebrated Halloween more! It will be a most thrilling conclusion! J/k. It’ll be… something. 😉 So cool that Halloween is your fave holiday too, Marsha! Maybe one day, you’ll get to visit/live somewhere that really gets into the spirit of things. I hope you love ’em! Happy Monday! 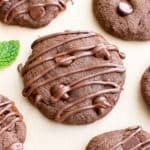 These treats are adorable and so yummy looking! 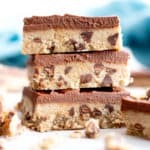 I can’t wait for our annual halloween party so that we can make these treats and the paleo almond joy bars! Also, I MUST know what happens next in the haunted house! I can’t wait for your next post! 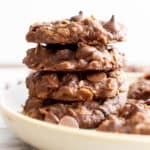 Thank you for always sharing incredible recipes and such fun, awesome stories! Bahaha! Well that’s a story for yea 😛 Haunted houses are usually so terrible, but if you just laugh the entire time, things never get “scary” and as long as you aren’t touched, it’s okay! As for movies…NOTHING scares me anymore. I used to be horrified of the genre as a kid, and then something snapped and I haven’t found anything that even gives me the creeps….I’m emotionless! Indeed! 😉 Knowing me, I would start laughing and then scare myself. Yep, dorky to the max. Lol. So interesting how they don’t scare you at all anymore! Go you! To be continued!?!?! How can you leave us like this, not knowing if you make it out alive (although I have a hunch ????) Oh man, the suspense???? If you can’t tell you really have me in the All Hallows Eve mood with this one, I was getting a little jumpy just reading along! Oh man I would’ve been a wreck in that haunted house. I’m the sort who screams very easily at everything, that’s why I’ve only ever been to Disneyworld for Halloween, not Universal. Now these little buggers are cute and creepy all rolled into one! Those red eyes???? Hey, you were the creator that enabled the with ever-so-strong pretzel legs, can’t blame them for scurrying around a bit during their photoshoot. They must’ve been tipped off about what happened after the photoshoot…THE SNACKING bwahahahaha!???? OMG…so much suspense! I am not a fan of Halloween at all. It scares me. I can never watch a horror movie unless I was to be awake in fear for a week. Bahahaha! You’re quite the story teller, Demeter! I literally laughed out loud when you said your sister put steel in her spine and moved forward. I can’t wait to hear the rest of the story! Perhaps you should post tomorrow instead of Thursday, k? This is why I don’t care for Halloween. I can’t stand those creepy haunted places. They freak me out. The thought of being in the dark too close to strangers and arms and hands going everywhere, it just makes me anxious and panicky. Can’t take it! I did go through one before, and that’s enough for me! Despite freaking me out, the spider treats are pretty darn cute. And I bet very tasty! I’m sure my niece and nephew would love ’em! Pinning, of course. P.S. You totally have me thinking about breadsticks now too, lol 😀 Have a great week, girl! Ahhh – this is like the season finale of The Vampire Diaries…. what happened???? I cannot.wait.to.find.out. Demeter, I haven’t been inside a bona fide Haunted house since I was 12 and since I’m @% now (“friends let friends gloss over age and such” – right?) that’s ages ago! I used to take my daughter when she was in single digits, but they weren’t the super scary ones so don’t count. A couple year ago, my daughter and her friends asked me to take them to a super scary place here in Atlanta called Netherworld – as all the other parents were ok with me taking them there but not going in with them, I stayed outside – and you know what??? There were scary gouls and goblins with chainsaws and headless ladies in 50s outfits out in the parking lot! Gah – I didn’t even pay to go in but I got a good scare outside!